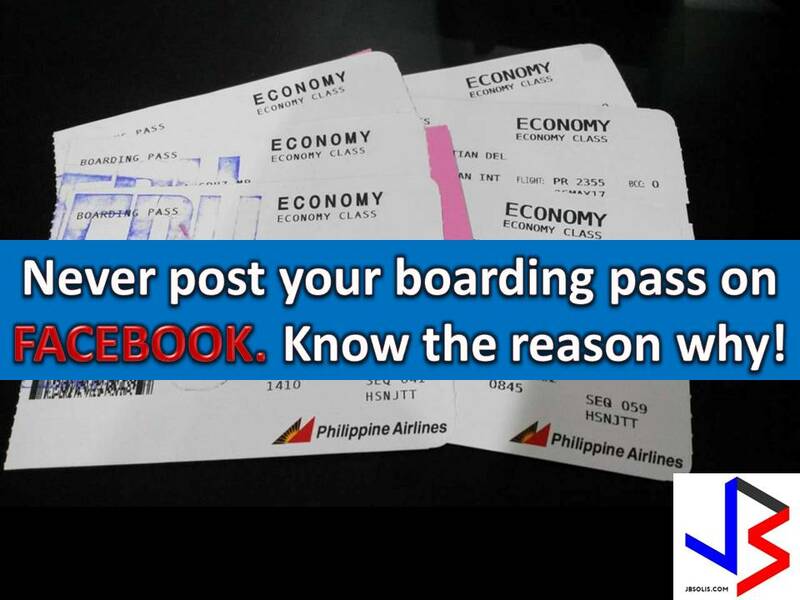 THOUGHTSKOTO Thoughtskoto : NEVER POST Your Boarding Pass on Facebook or Throw it Away. Here's Why! We love to travel, and when we do especially when we are traveling by plane, we cannot contain our excitement. We love to tell the world that we are traveling by posting our plane tickets or boarding pass to our social media accounts such as Facebook or Instagram. Sounds harmless rights, but don't you know that posting such things in social media is certainly not advisable. Do you notice that bar code on you boarding pass? The information printed on it actually reveals a lot more than you think. That contains personal information of yours as passengers such as your name, home address, contact number, email address, flight number, gate number, destination, and seat number. Sometimes, your financial details are also hidden behind that bar code. So the next time you snap that picture of your boarding pass to post it on Facebook or Instagram, think again. With the use of bar code scanners, that bar code will expose your personal information in public, and worse it can be stolen and used to crime. Identity theft is a real thing. There are websites also that can read bar codes on boarding passes and provide someone else access to your travel information. Boarding pass doesn't just display our name and your destination but gives people an access to some highly confidential information. By posting it, you are making it easy for them to modify or cancel your booking or any future flight, they can also reset your account pin. By posting it on social media or throwing it anywhere, you are just allowing hackers to get your personal details much easier. Other than this, refrain yourself also from throwing anywhere your boarding pass after using it because of the same reason mentioned above. Dispose of it properly so nobody can gain access to your personal information. But after all, if you really want to show that hard-earned business or first class ticket to your friends or family make sure first that you cover or blur out any vital information in your boarding pass.